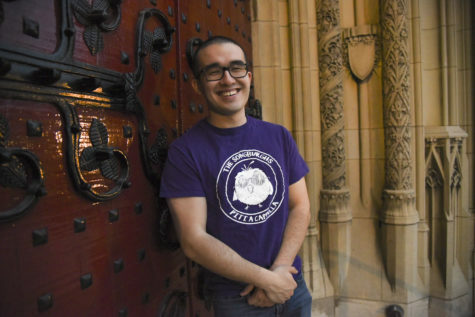 To most passersby, the fliers, posters and comics adorning the office doors in the narrow corridors on the fourth floor of the Cathedral of Learning blend in with the rest of campus. But for Tyler McAndrew, a visiting lecturer in the English department and prominent faculty union organizer, the posters that read “I support the Union of Pitt Faculty” represent years of grueling campaign work. McAndrew’s own office, nestled in a small enclave on the same floor, is outfitted with many of the same pro-union posters. 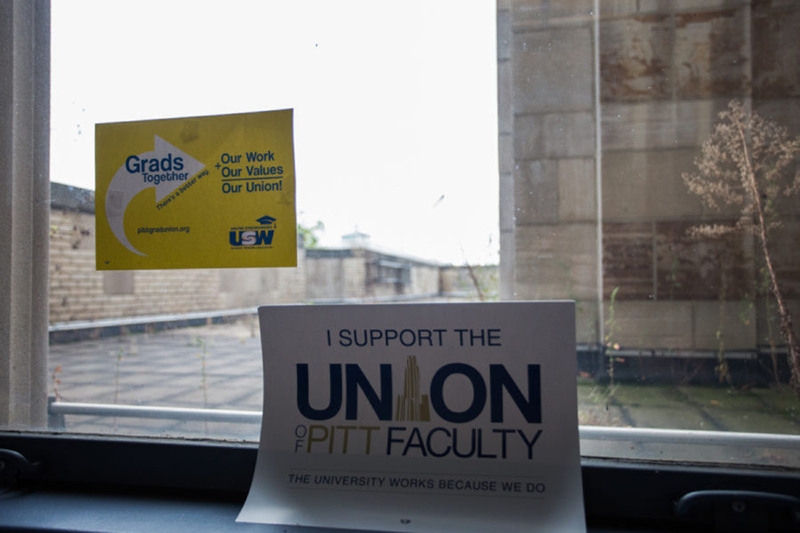 But while McAndrew is heartened to see pro-union fliers scattered all across campus, he said the most tangible sign that organizers’ efforts were successful came last month, when Pitt filed for a faculty union election with the Pennsylvania Labor Relations Board. Pitt Faculty Organizing Committee began collecting signed, confidential union cards from more than 3,500 Pitt faculty last January. According to McAndrew, the organizers spent several years campaigning with their peers before even beginning to collect cards, attending monthly meetings, refining their talking points and ultimately going out into the field to persuade other professors to support the cause. Once the PLRB verifies that more than 30 percent of faculty have signed cards, it will set a date for a union election, assuming the University doesn’t contest the filing. At least 50 percent of professors must vote yes to institute the union at the University. The union would be affiliated with the Academic Workers Association, a division of United Steelworkers, according to USW spokesperson Jess Kamm. McAndrew said he’s unable to reveal the number of professors that signed cards, but he thinks the union bid will succeed if it goes to an election. “We have supporters from all different departments, at all different levels with all sorts of different grievances,” McAndrew said. 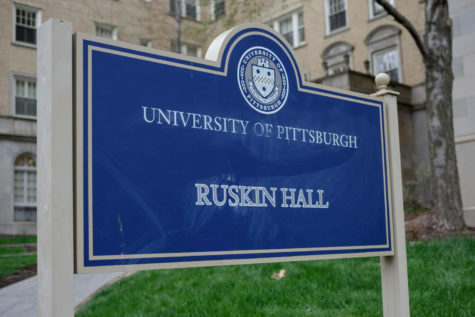 Among the union’s supporters is Caroline Brickman, an adjunct professor in the English department who came to Pitt in 2018 after finishing her graduate degree at the University of California Berkeley. There, she was a member of one of the country’s largest university labor unions, which represents all the UC schools. Brickman believes every laborer should be represented by a union, and she has many job security- and pay-related grievances with the administration that pushed her into Pitt’s faculty union campaign. The dismal pay for adjuncts doesn’t help matters either, Brickman said. 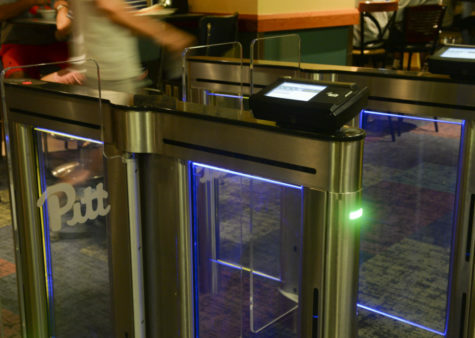 The Pitt faculty union website says pay per course can range from $2,500 to $4,000, which, full-time psychology professor Melinda Ciccocioppo said is far below the average pay for adjuncts at Pitt’s peer institutions. Pitt lecturers, who McAndrew said are “one step above an adjunct,” ranked 28th in annual salary when compared to 34 public institutions in the Association of American Universities, which is comprised of 62 distinguished public and private research universities across the United States. 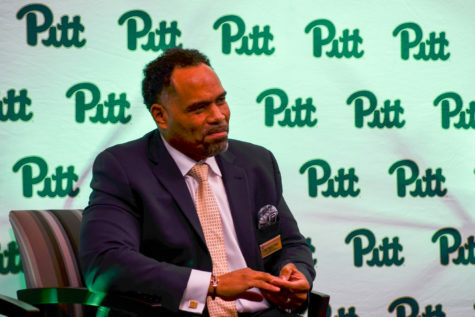 McAndrew said some of Pitt’s peer institutions, like Rutgers and the University of Oregon — which are public and comparable to Pitt in size — granted one- to two-percent raises to all faculty immediately after forming a faculty union. “In most faculty unions there’s an umbrella clause for all faculty. 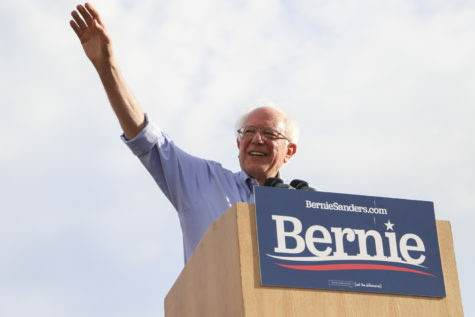 That usually includes a one- to two-percent raise for everyone across the board, which would disproportionately benefit adjunct faculty,” he said. That’s the easy part, McAndrew said. The challenging part is renegotiating employment contracts to give all faculty more job stability. If the union bid succeeds, the first step would be to elect faculty representatives from each department who could set up a committee to peer review employees’ contracts, and address other grievances within the department. While each department has a document outlining the path to promotion for tenure-track and full-time professors, Ciccocioppo said the criteria don’t specify the amount of research or teaching a professor must do. “We want to negotiate a legally binding contract that streamlines the promotion process to improve faculty stability across the board,” Ciccocioppo said. Those contracts are of interest to tenured professors as well, according to Marian Jarlenski, a tenure-stream professor in the public health department who said she supports the union. The administration is also very secretive about how it allocates its funds, according to Brickman. 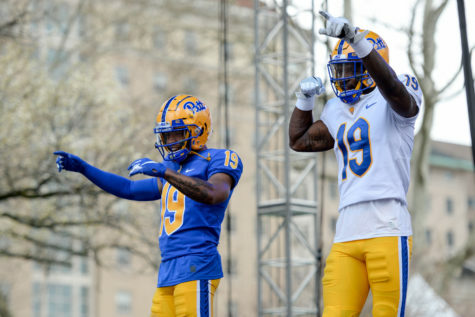 Besides publishing statistics about student tuition, average faculty pay and total endowment, Pitt often doesn’t reveal where its money goes. Pitt declined to say whether the University will contest faculty’s bid for a union. University spokesperson Joe Miksch said Pitt is still reviewing the petition filed with the PLRB. McAndrew said faculty interests are somewhat diverse — he’s spoken with professors from various departments who oppose the faculty union, mainly because they see it as a third party entity that will make sweeping changes to university operations. None of the professors The Pitt News spoke with opposed the union, however. The University has remained neutral toward the union in public, which McAndrew said he is grateful for. But he expects that to change as the PLRB gets closer to announcing an election date, especially given the way the University reacted to the grad student union campaign, which filed for election last semester. Pitt hired the Philadelphia-based law firm Ballard Spahr, which offers union avoidance training and counseling to employers, to contest the graduate student union. 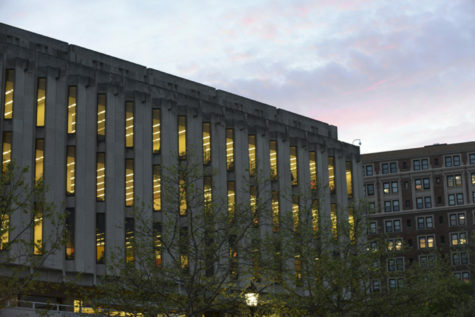 According to the University Times, Pitt hired the firm a week after a faculty assembly Sept. 4, where union representatives discussed their struggles with job insecurity and low pay. 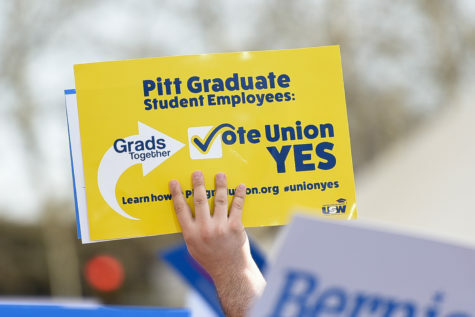 But while Pitt argued that graduate students are not employees and therefore don’t have the right to unionize, the University can’t use the same argument against the faculty union, Kamm said. “The University can register any legal concerns they have about the union, but they can’t just unilaterally say no,” Kamm said. Pitt faculty have attempted to and failed to unionize twice before, most recently in 1996 when organizers failed to collect signed cards from a majority of faculty members. Its first attempt in 1976 failed when faculty voted against the union 1,243-719. 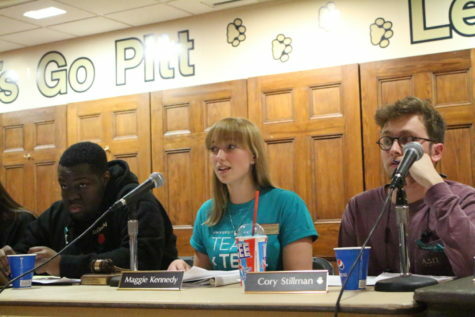 But McAndrew is confident the third time’s the charm for Pitt’s faculty union. McAndrew believe students will also reap the benefits of having healthier, better-paid teachers. 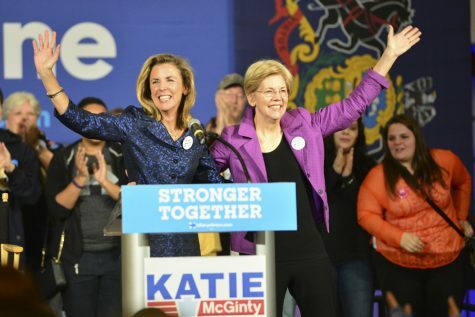 “I can say when I was an adjunct, I was teaching two classes here and working at a writing center twenty or thirty hours a week, and at points working a part-time service industry job, too,” McAndrew said. “I couldn’t pretend that I was coming in to teach with my mind not in other places. McAndrew maintains that all faculty should have a union to negotiate pay, have job security and ultimately give themselves a voice. He said it’ll benefit students just as much as professors. A previous version of the article listed the average pay for adjunct faculty as $2,500 to $4,000 per credit. This number is the average pay per course.